CAPE TOWN, South Africa -- Former heavyweight champion Corrie Sanders has died after being shot by robbers at a restaurant during a family celebration. He was 46. Police say Sanders was shot in the hand and stomach at a family member's 21st birthday party at the restaurant in Brits, in South Africa's North West province, on Saturday night. He died in a hospital in the capital city of Pretoria early Sunday morning. Sanders (42-4, 31 KOs), a heavy-hitting southpaw who fought professionally from 1989 to 2008, is best known for his massive upset of Wladimir Klitschko to win a heavyweight title in March 2003. Sanders stopped him in the second round in Hannover, Germany. Rather than face Klitschko in a rematch, Sanders, who was stripped of his title by the WBO, returned 13 months later to face Vitali Klitschko, Wladimir's older brother, for the vacant WBC version of the heavyweight crown. Lennox Lewis had vacated the belt when he retired in early 2004. Klitschko and Sanders, who had several lengthy layoffs during his career, waged a pitched battle at the Staples Center in Los Angeles before Klitschko stopped him in the eighth round. Sanders fought sporadically after the loss to Klitschko, fighting only four more times against lesser opponents over the next four years. Sanders' true love was golf and he considered pursuing a professional career in the sport. He retired after being knocked out in the first round by South African countryman Osborne Machimana in February 2008. Doug Benc/Getty Images Corrie Sanders, 46, was shot by robbers at a restaurant during a family celebration. The heavy-hitting southpaw was best known for his upset of Wladimir Klitschko. 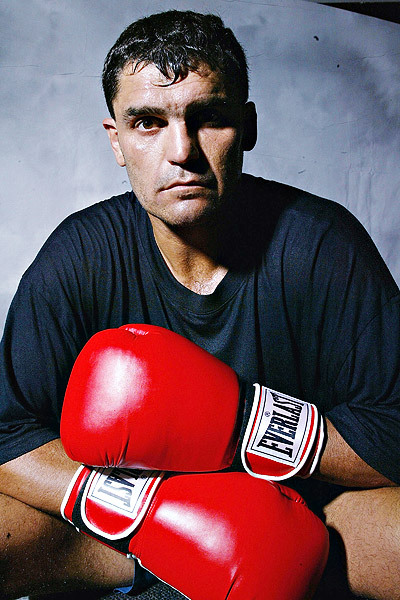 CAPE TOWN, South Africa -- Corrie Sanders, the South African southpaw who knocked out Wladimir Klitschko in one of the great upsets in heavyweight boxing, has died after being shot by robbers at a restaurant during a family celebration. The former WBO and WBU champion was 46. Sanders was shot in the hand and stomach at a family member's 21st birthday party at the restaurant in Brits, in South Africa's North West province, on Saturday night, police said. He died in a hospital in the capital city of Pretoria in the early hours of Sunday morning. Police Brigadier Thulani Ngubane said three armed men entered the restaurant with the apparent intention to rob it and shot randomly, hitting Sanders. No other injuries were reported. The robbers took a cellphone and a bag from customers, Ngubane said. No arrests had been made but a murder investigation has been opened. 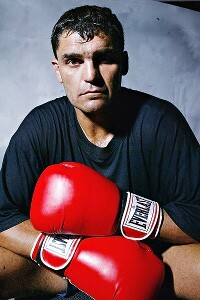 Renowned for his hand speed, the 6-foot-4 Sanders was one of South Africa's most successful and popular fighters after a nearly 20-year professional career. He retired in 2008 with a 42-4 record, with 31 knockouts. But he was most remembered for the shocking second-round knockout of Klitschko in Germany in 2003 that earned him the WBO title and respect across the world as a wily, fast and clever fighter and powerful puncher. It is one of only three losses for the Ukrainian and current WBO champion. Sanders agreed to the fight on short notice and was a 40-1 underdog. The result was voted as the upset of the year by Ring Magazine. He then lost to Wladimir's older brother Vitali for the vacant WBC title the following year, Vitali's first fight for the title he still holds. Sanders had earlier relinquished his WBU crown in a seventh-round stoppage by Hasim Rahman after being ahead in their fight in 2000. Born in Pretoria, Sanders began his professional boxing career in 1989 with a first-round TKO of King Kong Dyubele. Eighteen of the fast-starting Sanders' 31 career knockouts came in the first round. Sanders hung up his gloves in 2008 after being knocked out by Osborne Machimana for the South African heavyweight title – in the first round. South African who knocked out Wladimir Klitschko has been shot dead in an apparent robbery. Corrie Sanders, who held the WBO heavyweight title after knocking out Klitschko in Germany in 2003, died after a shooting incident near Brits, north of Johannesburg, on Saturday. Early reports on News24 and in Sunday newspaper Rapport said he died of a stomach wound after being shot during a birthday party at a restaurant. He was 46 years old. Sapa reports that Sanders died in Kalafong Hospital on Sunday. Police said he had been celebrating the birthday of his daughter when three armed men arrived in the restaurant and shot randomly. Police brigadier Thulani Ngubane said Sanders was shot in the hand and stomach. It appeared the gunmen had gone to the restaurant with the aim to rob it. "They shot randomly and took a cellphone of the daughter, who was turning 21, and they also took a bag of another patron," he said. However, Thatch Haven Country Lodge's owner Johan de Jager said Sanders was there to celebrate the birthday of his brother's son. "Michael's son was turning 21, and Corrie was also there when the gunmen came," he said. Sanders, who was also a single-handicap golfer, sensationally stopped Klitschko in the second round in Hannover. Having taken the fight at short notice, the southpaw South African was the 40-1 underdog. He dropped the Urainian twice in the first round before the referee stopped the bout in the second. In his next fight, in 2004, he fought Vitali Klitschko, losing on an eighth-round stoppage in Las Vegas where they met for the vacant WBC title. Sanders also knocked down Hasim Rahman with a trademark round-house blow in the second round but lost the fight in 2000 in the seventh round. He made his professional debut in 1989 and had his last fight in 2008, when Osborne Machimana knocked him out in the first round. He first held the SA heavyweight title when he beat Johnny du Plooy in 1991. He also beat Otis Tisdale and Michael Sprott, both well-known American heavyweights. Sanders finished with a professional record of 42-4, with 31 knockout wins. RON JACKSON writes that Sanders was born in Johannesburg on January 7, 1966. He was an outstanding amateur and won the SA heavyweight title in 1985, 1986, 1987 and 1988 before turning professional on April 2, 1989. His first fight was in Cape Town where he stopped King Kong Dyubele in the first round. He then won his next 22 fights, 15 inside the distance, before being knocked out in the second round by Nate Tubbs at the Carousel, Hammanskraal on May 21, 1994. On July 27, 1991 he knocked out Du Plooy in the first round to win the vacant SA heavyweight title at Sun City. He never defended the title as he kept fighting international opponents. He beat Nikolai Kulpin, James Pritchard, Curtis Shephard and Arthur Weathers before outpointing Ross Purrity to win the WBU belt. He had only six fights from 1998 to 2002, which included the seventh-round stoppage loss to Rahman in Atlantic City in May 2000. After beating Wladimir Klitschko, he relinquished the WBO title to challenge Vitali for the WBC belt in April 2004. He held his own in the early rounds but tired before he was stopped in the eighth round. He beat Alexi Varakin, Colin Wilson and, in May 2007, Daniel Bispo from Brazil before losing to Machimana in his last fight on February 2, 2008.